Not so much a recipe, this, more a series of suggestions. 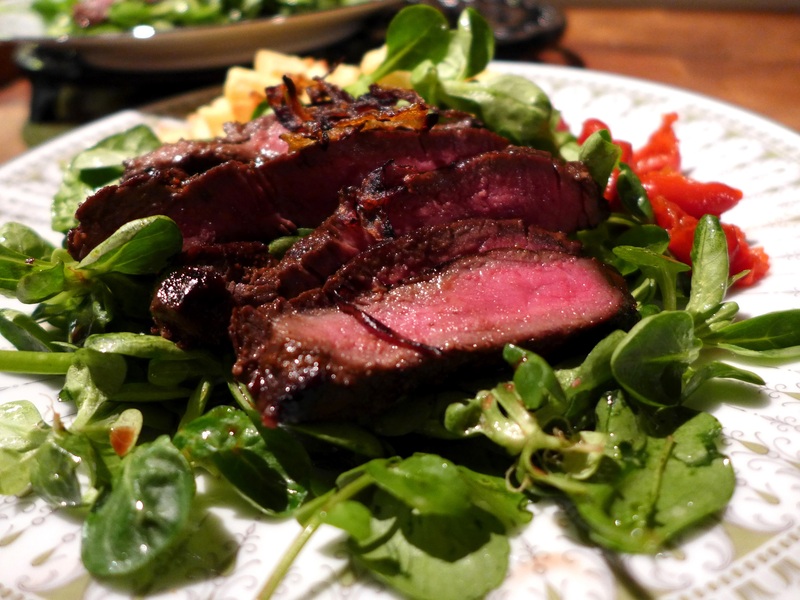 At its simplest a steak salad is just that, strips of juicy rare steak, hot from the pan, piled on top of a green salad. 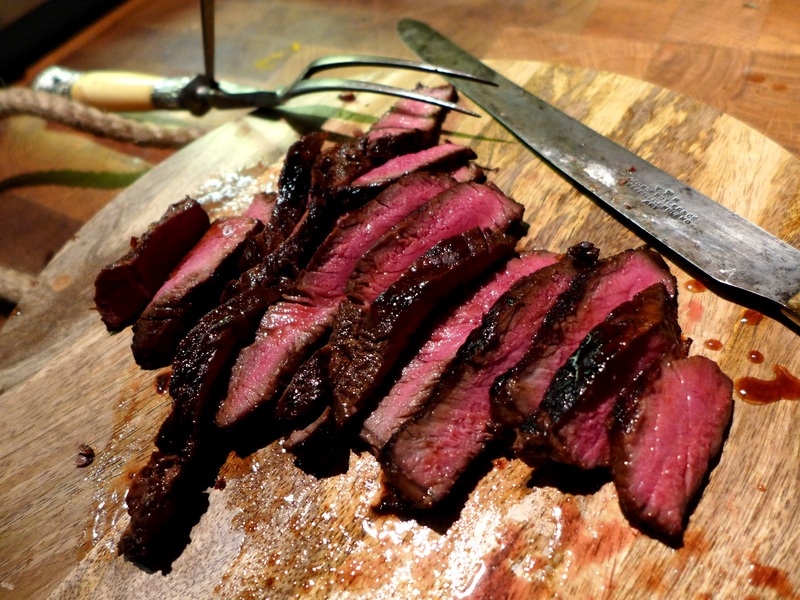 How you marinade the steak (if you do) and what you put in the salad is up to you. It makes a fast and healthy supper, if you politely ignore the fries Him Outdoors had on the side. There are umpteen combinations. Lettuce, rocket, lambs’ lettuce, baby spinach, chicory or a mixture. Tomatoes, onion, avocado, spicy roasted peppers, asparagus, French beans; blue cheese, goats’ cheese or feta; herbs, croutons, hard boiled eggs. A straightforward vinaigrette dressing or one with added blue cheese, garlic, chilli, mustard, honey, ginger, lime. If you have time, a marinade for the steak: oil, a little vinegar, garlic, sliced chilli or hot sauce, soy sauce, herbs and spices, what you will. Not all of these all at once, obvs. And the steak itself: fillet tail, sirloin, rump, feather steak, minute steak. I’d just suggest, as it’s the star of the show, that you buy the best you can afford. A little goes a long way in this recipe and you can easily stretch one steak to feed two people. If the steak is very thick, place it between two pieces of grease-proof paper and bash it a few times with a rolling pin to flatten it slightly. Mix the marinade ingredients in a non-reactive dish and add the steak, turning it to coat. Cover and leave to marinate for half an hour, longer if you have the time. Whisk together the salad dressing, adding the oil last so it thickens. Check the seasoning, taste and adjust; I like my dressings sharp. Heat a griddle pan until it’s smoking and quickly flash-fry the steak so it’s browned on the outside but still rare in the middle. Set aside to rest for a few minutes while you dress the salad. Pile the salad onto plates, slice the steak into strips and heap it on top, adding a chunk of lime to squeeze over if you like. Eat immediately. This entry was posted in Beef, Mains and tagged hot and spicy steak salad, steak salad by Linda Duffin. Bookmark the permalink. My own father was a pathologist and prided himself on his carving skills. I work hard to try to emulate his wafer thin roast beef slices. I think of him every time I carve. Wow – harissa and medja! I’ve got to make this! Steak and greens are wonderful together. My favorite—no surprise—is the Italian way, tagliata, sliced steak served over arugula drizzled with olive oil and topped with shavings of parmesan. Yummy! Sounds like a wonderful salad. I really like that the meat is served rare. Thanks, Donald, and thanks for the follow. Rare is the only way to go in our house!